The limo caught fire trapping people inside, according to witnesses. Five women in their 30s died Saturday night when a stretch limousine burst into flames on the San Mateo-Hayward Bridge over the San Francisco Bay, police confirmed to NBC News. Four other people in the limo escaped with burn and smoke inhalation injuries, California Highway Patrol Officer Art Montiel said. The car's driver was unhurt. Montiel said the women were "probably killed by the fire," though the cause of death has not been confirmed, NBC News reported. The car was driving from Alameda to Foster City, Montiel said. 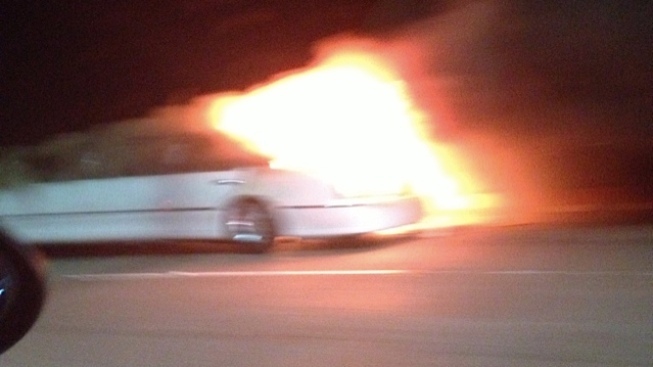 A viewer named David Solomon sent in the picture above that he said of was of the limo. The fire was first reported around 10 p.m. in the third lane of westbound state Highway 92, according to the California Highway Patrol. The bridge, located about 20 miles southeast of San Francisco, connects San Mateo and Alemada counties. The westbound lanes were closed for several hours.